Frugal & Fabulous: Giveaway: Mary Kay True Dimensions Lipstick! Giveaway: Mary Kay True Dimensions Lipstick! My friends at Mary Kay have some exciting news and to celebrate they are offering a giveaway of their new True Dimensions lipstick! Read below for more details and how you can win! Mary Kay will be honored at Pratt Institute’s 2014 Art of Packaging Award Gala for its outstanding commitment to package design. The gala benefits the Marc Rosen Scholarship and Education Fund for Packaging by Design at Pratt Institute, which provides scholarships to masters-level students looking to pursue careers in cosmetics and packaging design. In celebration of this honor, Mary Kay is excited to share its innovation in product design technology. What began in a tiny store in the heart of Texas with nine products, five color cosmetic palette and four-step skin care regimen, Mary Kay now offers more than 200 premium color cosmetics, skin care, fragrance, body, sun and men’s products. 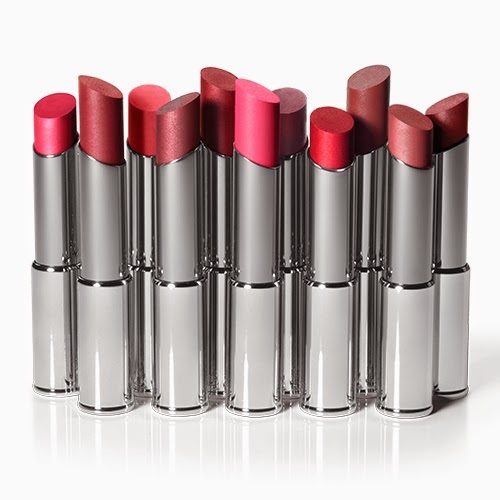 · In fact, in 2013 alone, more than 3 million compacts and more than 19.4 million lipsticks were sold. For more than five decades, Mary Kay has led the way in giving women what they crave. Always committed to evolving to meet women’s changing beauty needs, the company is constantly redesigning and modernizing to help ensure every detail of its products and packaging are relevant and contemporary. One facet of ensuring products stand-out is the packaging itself. Mary Kay excels in this category, typically sketching out approximately five to eight different concepts during the design phase to help ensure packaging is not only attractive and ergonomic, but the ideal delivery system for the product. Through all the milestones, one constant has remained: innovation. This is especially evident with two very recent and unique designs:Mary Kay® True Dimensions™ Lipstick The distinctive trim-line design of Mary Kay® True Dimensions™ Lipstick was developed to create a lipstick that would modernize the application experience. The same “clicking cradle” technology was used for the MK Men’s True Original™ Cologne Spray, with the whole cap doubling as a case. The attractive, yet functional, design was intended to be more durable and “gadgety,” essentially helping protect it from leakage or breakage. "The Art of Packaging Award is presented annually to a company that has excelled in the art form of package design,” said Sheryl Adkins-Green, chief marketing officer of Mary Kay. “Mary Kay is honored to earn this prestigious award from Pratt Institute. We are motivated to continue in our path of excellence in modern design and helping women discover what they love about Mary Kay.” The 2014 Art of Packaging Award Gala will be held on May 6, 2014 at a private club in New York, with Sheryl Adkins-Green, chief marketing officer for Mary Kay Inc., accepting the award. Tickets to the gala are available for purchase by calling 212.925.2507. I like MK mascara and the Nurishine Lip Gloss. I'd like to try the Satin Lips lip mask. They have great lotion for my cracked hands! I haven't used Mary Kay in a while, but I've heard good stuff about their makeup! I have a friend who used to work with MK and her makeup was always flawless. I'd like to try their foundation. I love their eye shadows! I love Mary Kay's mascara. I would like to try the Nurishine Lip Gloss. I'd like to try their mascara! I love the Mary Kay Satin Hands. Their Eye Makeup Remover is by far the best out there! I love Mary Kay mascara! One of their really light pale pink lipsticks would be nice to try. I'd like to try the TimeWise Miracle Set. I love the true dimensions in firecracker! I like their TimeWise Matt Wear Liquid Foundation. Their cc cream sounds intriguing! I like their time wise and foundation primer. My Favorite MK Product is there eye primer, I've always wanted to try the Brow Gel or the Lash & Eyebrow Serum. i would like to try the mary kay Pink Chérie lipstick. huge fan of the eye makeup remover!! I would like to try the lipstick. I would like to try the Lemon Parfait Pedicure Collection, thanks! I'd love to try the Mary Kay® Botanical Effects® Hydrate Formula 2 . My Favorite MK Product is the Lash Love Mascara and Nourishine Plus Lip Gloss, but I've always wanted to try the MK CC Cream because it's new and I've also desired to try their lip primer to make any lip product last longer on my lips.